The latest issue of Clann, the newsletter of the Irish Family History Foundation, has just been published and brings news that the organisation's online database, RootsIreland.ie, is going to be revamped. This has been in the pipe for a while, so it's good to hear it's now going to happen. There's also the promise that 'substantial amount of new data' will be added before the end of the year. Let the speculation begin! 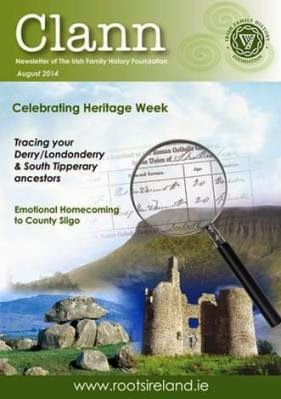 You can also find out what the folk at Sligo Heritage Centre have been up to, and discover what resources are available at the Dun Laoghaire Heritage and Genealogy Centre and the Bru Boru Cultural Centre in Cashel. In addition, there's a three-step guide to tracing your ancestors in Derry-Londonderry, details of book releases and summer events, and a couple of stories about successful research. The digital newsletter is free and can be viewed by clicking the cover page image.